Production Meditation With a Pencil Co., Ltd.
Nostalgic in both form and content ? hand drawn in pencil and set in 1980’s and 90’s Korea ? Green Days captures adolescence in all its frivolity and whimsy. Yi-rang (Park) and Cheol-soo (Song) are both high school students with lofty aspirations. Yi-rang has always sought athletic stardom, but recently she has began to think that giving up this dream might be more satisfying that her continued success. Cheol-soo is a scholar who finds pleasure in scientific endeavors and dreams of a laboratory life. These two begin a windy path towards first love alongside Soo-min, a recent transfer student from Seoul. While some critics have criticized the film’s lack of tension and climax, it’s incessant light-heartnedness only amplifies the nostalgia generated by its downtown railroad crossings, dated attire, and matching soundtrack. Co-directors Ahn and Han have previously worked together on multiple animated shorts. 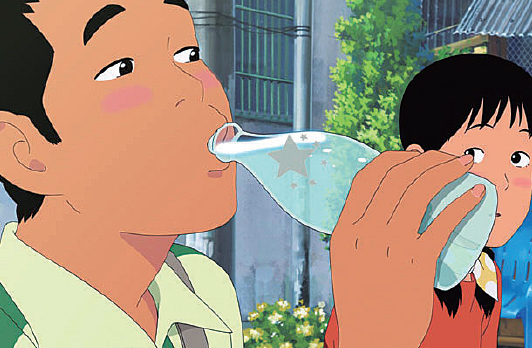 Green Days, their feature debut, was invited to this year’s Annecy International Animated Film Festival in France often called the Cannes of the animation world.